This warm yet chic and comfortable top from Miss Fortune is the perfect piece to pull me in from uncontrollable heat to the chilly breeze of Southern California winter. This Kitty top is made from a thick and stretchy ponte fabric, which is perfect on its own but is a great foundation for layers in those colder climates. 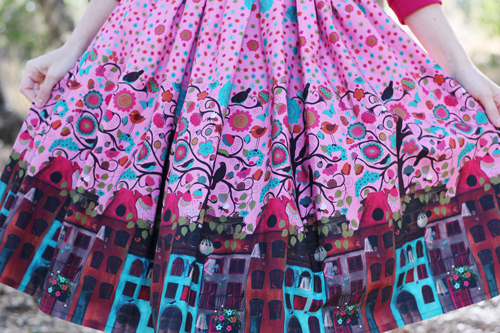 It comes in an assortment of gorgeous colors but this cerise shade matches perfectly with their new Amsterdam print Boardwalk skirt. I'm such a sucker for novelty prints but fun destination prints are at the top of my list! This 100% cotton skirt features a side zip with a top button closure, right side pocket, and a full skirt perfect for twirling. I'm seriously in love with this skirt! Well, holiday season is now in full swing and I couldn't be more excited. Not only do I get to enjoy the usual holiday fun, but I also get to celebrate my birthday, my brother's, and my baby girl's birthday too. It can be overwhelming at times! But I'm determined to embrace the spirit of the holidays and forget about the stress. What do you do to combat the holiday stresses/blues?